Pass Your Florida Commercial Driver's License Test with EASE! Are you in the process of obtaining your Florida commercial driver's license? If so, we have the one resource that you need. Our Cheat Sheet provides you with ONLY the information necessary to complete your written tests, and nothing more. You don't have to worry about finding the info you need or wasting time studying materials that won't be on the test. With our Cheat Sheet, you can study efficiently and effectively. Give yourself the best chance of passing your CDL test on your first try - use our Cheat Sheet and you'll earn your Florida commercial driver's license in no time! As with every other state in the country, you must be at least 18 years of age to obtain a Florida commercial driver's license (CDL). 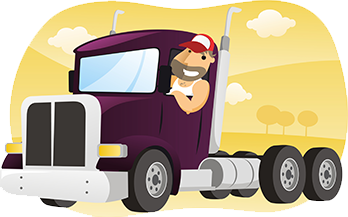 With your CDL permit, which you can obtain at 18, you will be restricted to driving within state boundaries. To operate a commercial vehicle across state lines, you must be at least 21 years old. To obtain your CDL permit, you will need to self-certify the type of vehicle that you intend to drive as well as the type of commerce you will be conducting. You will then be required to pass a vision test and written knowledge test covering a range of related topics, including trucking regulations, traffic laws, road signage, and safe driving techniques. To pass this test requires advanced preparation; otherwise, you run the real risk of failing on your first attempt. 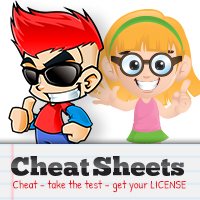 Don't take that risk - "cheat" with our Cheat Sheet and earn your Florida commercial driver's license with ease! Cheat! Take a Florida CDL Practice Test! Earning your Florida commercial driver's license requires you to be familiar with a wide variety of topics, including the types of available commercial licenses - Class A, B, or C - the regulations that apply to intrastate and interstate trucking, the various endorsements that you can earn, and traffic laws. Keeping track of all of this information can be difficult, and studying for your test can be nearly impossible without the right study guide. Enter our Cheat Sheet. It has been designed as an easy-to-use, convenient, and comprehensive guide, and it makes a great supplement if you are taking a Florida CDL practice test online. Don't leave your success up to chance - start "cheating" today. If you're not looking for a CDL Cheat Sheet, worry not. Explore your options below.